Pre-Ordering, Pull & Hold, Package System Hold Box - what is it? Call it whatever you want, but basically it's telling us what you want and then when we get it, we hold it for you. 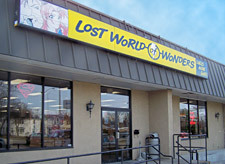 Unless otherwise noted, web site contents © 2011 Lost World of Wonders, all rights reserved.